The nurse-patient relationship is a professional interaction based upon care which supports a patients well-being. In order for this relationship to be successful, it needs to be founded on two core values: trust and respect. People in various mental and physical states come seeking medical help, which can be intimidating or fear-evoking in some cases. You never know the background of the patients that come into your office and their level of trust and respect with your nurses or doctors. The best way to increase this trust and respect is through effective communication, specifically the communication that goes on between nurses and patients. The University of San Francisco has identified a huge inconsistency in communication between nurses and patients. 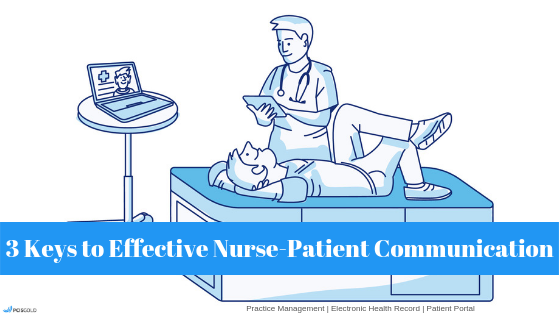 In their study, researchers interviewed 40 inpatients about nurse communication. They found that many patients had a slim idea of what they were prescribed and why they were taking certain medications. When patients were asked about medication, only 25% knew the names, 50% knew the purposes, and only 15% knew the side effects of the medicines they were taking. Effective communication and clear explanations from nurses are the strongest factors in improving the overall patient satisfaction. This can be accomplished in three simple steps. In order to increase patient satisfaction regarding safety, focus on improving the communication that goes on between nurses and patients and, if applicable, their families by mandating a proper introduction by the nurse. Not only does this increase nurse transparency but patients will understand they are receiving quality care and will feel the medical office they are in is patient-centered. When nurses first meet a patient at work, they should clearly state their name, job title, and specific roles in patient care during their visit. This introduction could also include a review of the purpose of their visit and of any information the patient has given them. By reciting this information back to the patient nurses can be sure they have the right information and prevent mistakes. This action also shows that the nurse is actively listening to the patient and their concerns are addressed and heard. By being specific and clear, patients will have a better understanding of what is going on and understand their nurse is accessible. This understanding can lessen feelings of nervousness or fear in the patient and help them know they are safe in good hands. In the healthcare industry, lines may become blurred between maintaining a professional distance and getting to know the patient on a personal level that may be reciprocated. Nurses should understand how to keep a certain emotional distance from patients. It is important to set boundaries for legal, ethical, and personal reasons. These boundaries can be communicated verbally or nonverbally. Setting clear boundaries can help when establishing the roles of the nurse and the nature of the relationship. The nurse-patient relationship is classified as a therapeutic relationship. This is defined as the nurse being the primary caregiver and the patient as the recipient of this care. The relationship revolves around the patient’s needs but is based upon the nurse’s ability to assess their situation and provide competent care. These relationships are considered purposeful or goal-directed. Maintaining proper boundaries is important to be respectful of the patient. It’s crucial to consider a patient’s boundaries. Some may feel comforted when they are offered a hug, or if their hand is held during a painful or frightening procedure. Others may see these actions as inappropriate and uncomfortable. The context of their situation, visit, and any previous relationship or encounter with the nurse will help determine proper boundaries within your office and with that patient. Be sure your nurses and office staff are respectful of differences in personality and culture. Right off the bat, ask patients what they like to be called and address them by that name. Referring to the patient by their name is a simple gesture that displays friendliness, care, and attentiveness. These actions help reassure patients they are in good hands and safe. Calling them by their preferred name shows the nurse is taking a genuine interest in the patient’s life and in their situation. It encourages a friendly foundation to build rapport and a healthy nurse-patient relationship. While this aspect may not always manifest as verbal communication, much of it can be picked up through non-verbal cues. Regardless of the form, emotions are still present and communicated. As a nurse, it’s necessary to be aware of the patients’ emotions and being empathetic. Empathy can result in the modification of patients’ emotional state, especially lessening anxiety and fear. This idea of being sensitive to the feelings of patients can also be known as being emotionally intelligent. Research shows that individuals with greater emotional intelligence have better interactive skills, are more co-operative, and form closer relationships with others. Nurses who display emotional intelligence are likely to have healthy, strong relationships with their patients, and patients are more prone to be at ease. Emotional Intelligence is important on a social and professional level. While it helps to build satisfying relationships, it also helps ensure quality medical care. To be an emotionally intelligent nurse means to be able to make educated decisions and act on what is best for those in your care. It could include utilizing these emotional perceptions to achieve specific goals, such as safety or well-being. Nurse-patient relationships improve drastically when nurses are able to perceive and understand patient emotions, then utilize these emotions to assist in quality patient care. Whether you’re doing a routine check-up or helping rid a life-threatening disease, your role as a nurse is paramount to the patient's experience. By improving communication through the implementation of these three aspects, your nurse-patient relationships can be successful, strong, and satisfying.